French Director Domique Benicheti showcased his 70mm 3D DTS short, "La Revole", at the 2000 Large Format Cinema Association (LFCA) Conference in Los Angeles. Attendees were eager to see his film which was originally shown at the Museum of Wine Romaneche Thorins in France. Though the film was shown at a private screening for LFCA members in 1999, it was shown only in 35mm 3D. Benicheti was encouraged by Imagica, Inc. President, Christopher Renya, to blow-up the film to 70mm specifically for the 2000 Conference. Through his lab, Gulliver, Benicheti obliged. "La Revole" is a clever fantasy about how wine is made. Benecheti, who not only directed the film, but also wrote it, had many obstacles to overcome in shooting the it. For one, the budget was under $500,000. The film was supposed to be short, filmed in only a few days and had to be a musical-comedy in 3D. The director, a man with a sense of humor, took on the challenge with zeal. The end result is well done, especially knowing Benicheti's limited budget and time constraints. The film was shot in with Panavision cameras and lenses in Super 35 double-system 3D. "La Revole" was originally shown at the Museum of Wine Romaneche Thorins in 35mm 3D with DTS. Fortunately, it was blown-up to 70mm 3D and DTS for the LFCA Conference. Whether or not it will be shown this way in France is not known. The quality of the blow-up is good. 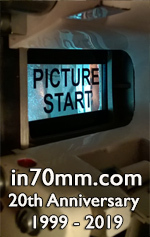 Slight grain accents a soft picture overall, but nonetheless, the movie looks good in 70mm. Some 3D gimmicks are employed, but mainly to tease an audience who's already in on the light-hearted fantasy of "La Revole". The cinematography is splendid and never appears to be low budget. Acting and sound are professional as to be expected from a director with a solid background in special format cinema. Benicheti was the writer/director on "The Price of Freedom", a 360-degree short, co-director on "Poitou", a 70mm/48 fps short and director on "Le Cousin Jules", a 35mm widescreen documentary in 1974.